Core Summary Briefing, AD 2510 August 17. The Core don’t have a single “look” to them. They are built to purpose. They do share some commonalities. 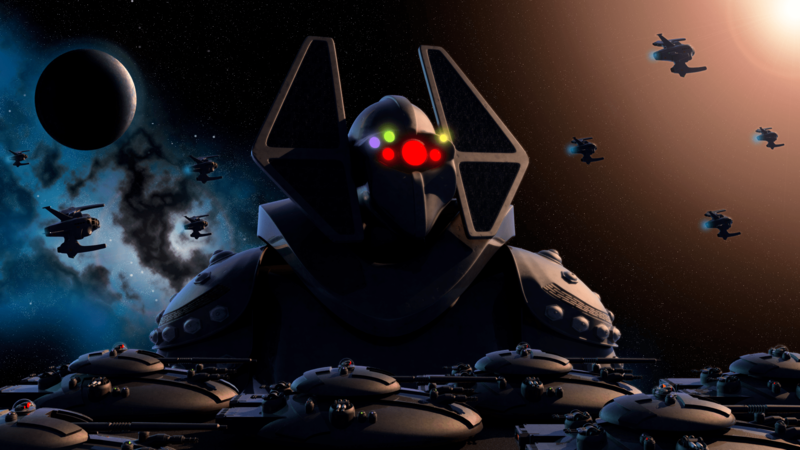 The Core “eye” is installed on every unit, though some larger units have multiple eyes to gain 360 degree visual coverage, often the eye is on a fast “ball turret”. The eye can view in different spectrums and will emit a different color glow between modes, red for infra red, green for night vision, blue-white for bright environments, etc. They are not built to emulate biological forms. A core “brain”, or CPU, can be internal or external but is roughly the same size for all combat and support units and is in an armored, shielded casing that is easily identified. Anything can be a Core unit: A building, tractor, crane, tank, plane, transport, ship… along with all the “bots”. “Bots” are chassis built units with a singular function in their construction. To name a few, Scanner, Engineer, Constructor, Assault, Sniper, Mortar, Artillery, Anti-Tank, Anti-Air, Research, Command, Communication, and Repair. Command units are particularly formidable, larger, heavily armed and armored, and always escorted by a wide array of combat and support bots. Combat units can sustain a very high degree of damage, and as long as the CPU remains functional, it will continue to carry out its mission. Even if the “eye” is damaged, they can still function, albeit not as effectively. To date, successful counter-attacks and rare intel revealed that a primary directive of all Core units is the extermination of “intelligent” biological forms. Soldiers of all races have learned the hard way that even a building will try to kill you. Core soldier bots and units are heavily armored and have developed formidable PSU’s (Personnel shielding Units). Their solid alloy construction is either dull grey or blackened and has a visual “shimmer” to it when the PSU is active. They have no markings that would allow one to be distinguished from another same type of unit. Sticks and Stones won’t penetrate the power shielding, let alone the armor or metal infrastructure of a Core unit. Every unit operates on an independent fusion power cell-core. Though destroying a Core unit will cause an explosion that can create a deadly spray of shrapnel, they are controlled micro-fusion cells that do not go thermonuclear. Core units communicate with each other, their command, and communication units with a technology that has not been discovered by any of the races. Behavioral analysis suggests that it is instantaneous, and can cover great distances. Analysts postulate that “regular” units have a within solar system range, command units have a several sector range, and specialty communication units seem to operate without limitation. The actual origin of the Core as a race is unknown. They are named for the galactic Core systems, where they first appeared to mark the end of the Galactic First Age. Much fiction and conjecture has been written on the subject during the Second Age, but with the continued defeat and loss of systems by the United Space Federation, as well as the other three great races, no theory has been proven.